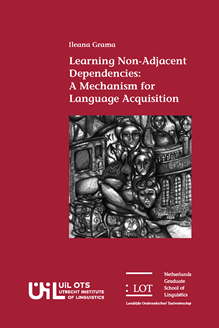 This dissertation explores the human ability for non-adjacent dependency-learning (NADL), which allows adults and infants to track the relationship between a and b in an aXb string. I use artificial grammar learning with adults and infants to investigate whether NADL could facilitate the detection of morpho-syntactic dependencies in natura languages (The princess is gently kissing the frog). Morpho-syntactic dependencies are typically instantiated between functional morphemes (is, -ing), straddling lexical morphemes (gently, kiss). Functional morphemes are often less prosodically prominent than lexical ones. I investigate the role of prosodic cues in NADL: both adults and infants learn aXb dependencies when a/b are prosodically prominent, but also when they are prosodically weak compared to the intervening X. The prosodic properties of natural languages could thus facilitate non-adjacent dependency learning. Early familiarity with the individual units of a morpho-syntactic dependency seems to precede learning of the dependency itself. I investigate how prior familiarity with a/b impacts learning aXb dependencies for adults. Previous findings suggest a negative effect of prior familiarity with a/b, but I find that these results are based on a confound relating to the sequential presentation of two learning phases (learning a/bs, and learning aXb dependencies). Eliminating this confound, I find no significant disadvantage of prior familiarity with a/b. Finally, I show that adults can generalize a_b dependencies to novel aX’b strings (with unfamiliar X’), but 18-month-olds show no such generalization. Young learners may only be able to track dependencies in familiar contexts.